The euro zone's recovery will not be affected by contagion from growing fears over emerging economies, Eurogroup chief Jeroen Dijsselbloem has said. "I don't think that there will be any contagion coming from those kind of risks in emerging economies back to the euro zone, no," the Dutch finance minister added. The worries over emerging markets such as Argentina and Turkey come as the euro is overcoming the worst of its debt crisis. Fears of turmoil in emerging economies were sparked last week after Argentina's peso slumped by 14% in two days. Turkey's central bank announced it would hold an extraordinary meeting tomorrow as the lira slides further against the euro and the dollar. The ruble has also fallen heavily. In Paris, French central bank chief Christian Noyer agreed that the euro zone was unlikely to be affected. "There is no reason that Europe should be particularly hit by problems in a small number of emerging countries," he said. "I think they can fix them fairly quickly." The head of Germany's central bank or Bundesbank, Jens Weidmann, said the troubles in the emerging markets were a "call to carry out reforms." Asian markets sank after the worst losses on Wall Street in seven months, with investors worried about emerging economies days ahead of a crucial Federal Reserve policy meeting. Japan's Nikkei index , which was the best performer last year, continued its 2014 downtrend as the yen remained elevated against the dollar. Shares in developing countries also suffered selling pressure. 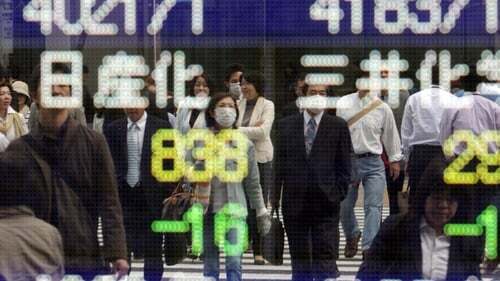 The Nikkei tumbled 2.5%, while shares in Seoul fell 1.56%, Hong Kong dived 2.1% and Shanghai gave up 1%. Elsewhere, Taipei dipped 1.6% and Wellington was down 0.4%. Manila fell 1.8%, while shares in Bangkok dropped almost 2% and Mumbai fell 2%. Singapore ended down 1% while Jakarta ended down 2.6% weaker. Kuala Lumpur slid 1.3% while markets in Sydney were closed for a public holiday. European markets closed lower this evening, with shares in the UK down 1.7%. Traders will now be looking to this week's US Federal Reserve Fed meeting to see if it announces any further cuts to its stimulus programme. The central bank last month said it would reduce its bond-buying by $10 billion a month from January to $75 billion, citing a pick-up in the economy. However, the move has raised fears of a capital flow from developing countries as investors repatriate their cash to the West.